Add Canton Paradise to your favourites! Be it Dim Sum, soup, or roast specialities, Canton Paradise will not fail to tantalize your taste buds. There are 7 Canton Paradise outlets in Singapore. Call to make reservations for a table or a private room. Visit the Paradise group webpage to find out about the latest promotions and to view the full menu. 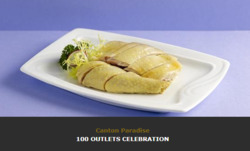 Canton Paradise belongs to the Paradise group, an award winning chain of Chinese restaurants in Singapore. You can now find Paradise restaurants in major cities like London and Tokyo. Do you want to receive more offers from Canton Paradise by email?